And look! It’s not a sock! Yea! I worked on it a bit on Sunday and Monday, and then finished up the knitting on Tuesday night. Then into the washer it went. Two extra-hot cycles in my front loader were enough to reach the result I desired. 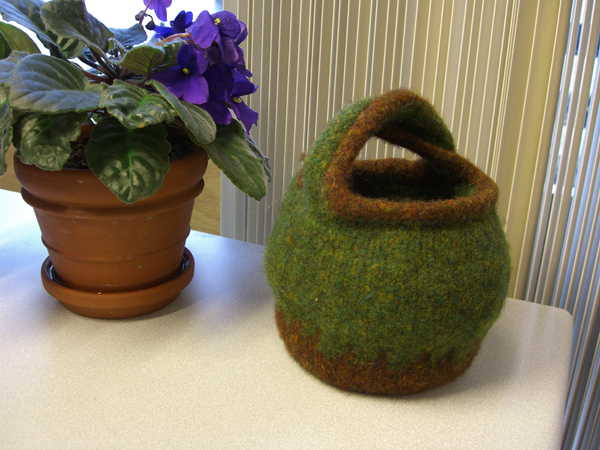 It’s felted hard enough to hold its shape, but there is still a tiny bit of stitch definition. While it was still wet, I molded and squooshed it a bit so that the bottom would be flat and the sides would have the shape I wanted. Then I stuffed it with rolled up washcloths and let it sit until dry. While knitting it, I allowed the handle to curl a little rather than forcing it to be flat because I liked the way that looked. I was aiming for something vaguely organic looking, as though it might have sort of grown on top of my desk. I think I mostly succeeded. 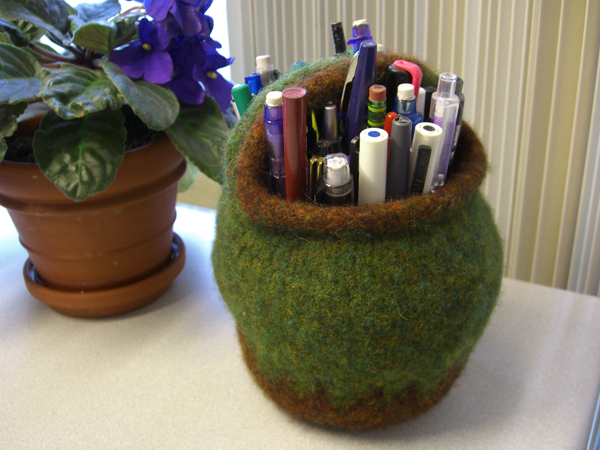 My pens and pencils used to reside a small flowerpot. The flowerpot is now inside the moebius bowl. The flower pot adds strength and a little more rigidity. If I only had a few pens and pencils, probably I would have been OK to leave the flower pot out, but with that many something more than felt is needed. Fortunately the flower pot just fit in perfectly. Bowl was knit using magic loop. I still don’t like magic loop, but I only have one US#9 needle apparently, so I was stuck. I have also frogged out the moebius from hell that was too long, and have started re-knitting it. I think it will be much shorter this time. I’m about half finished with the re-knitting. The original had 3 rounds of seed stitch and a k2tog bind-off. I think I will keep the seed stitch. I’m debating whether to do the k2tog bind off again, or do an applied I-cord. Your thoughts, gentle reader?